I like to think of the English chefs Nigel Slater and Hugh Fearnley-Whittingstall as my “cooking boyfriends”. They are often with me in the kitchen whether it be following a recipe from one of Hugh’s River Cottage cookbooks or an inspirational idea from one of Nigel’s columns on The Guardian website. Both Nigel and Hugh give me great recipes but best of all I like the way they write about food. Looking at the photos above I realise they do look alike. 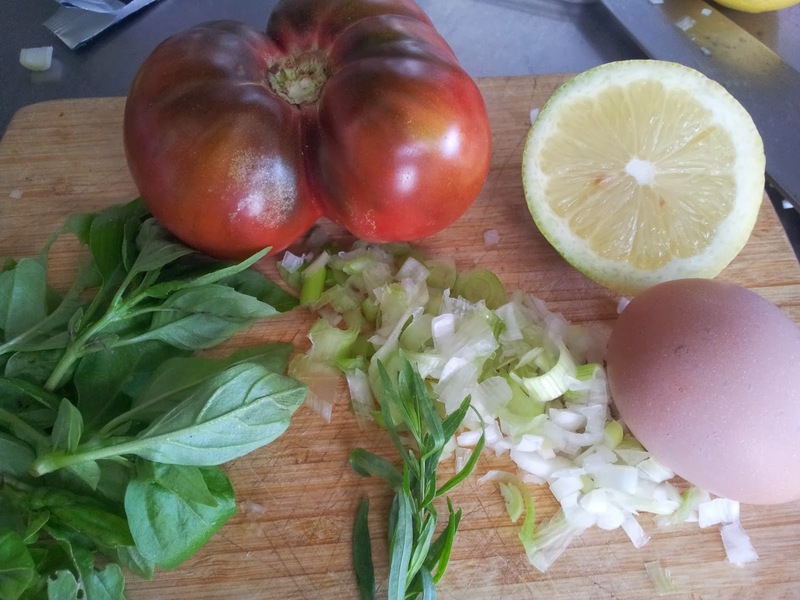 They are alike in that they each encourage home cooking using fresh and often home grown produce. They are different because Hugh lives a country life at River Cottage farm and has actively participated in campaigns to improve the tragic lives of egg laying hens and the chickens who never get to leave a cage, protested at the dumping of fish in the sea and the price of milk in the UK (sounds familiar!). Whereas Nigel appeals to those of us living in an urban landscape. How encouraging it is to see the range of vegetables and fruit he can produce in his compact back garden in London. 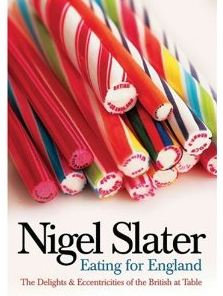 Nigel’s descriptive writing style clearly conveys his passion for food and its infectious. He makes me laugh, especially in his book “Eating for England”. I haven’t until now owned a Nigel Slater book. 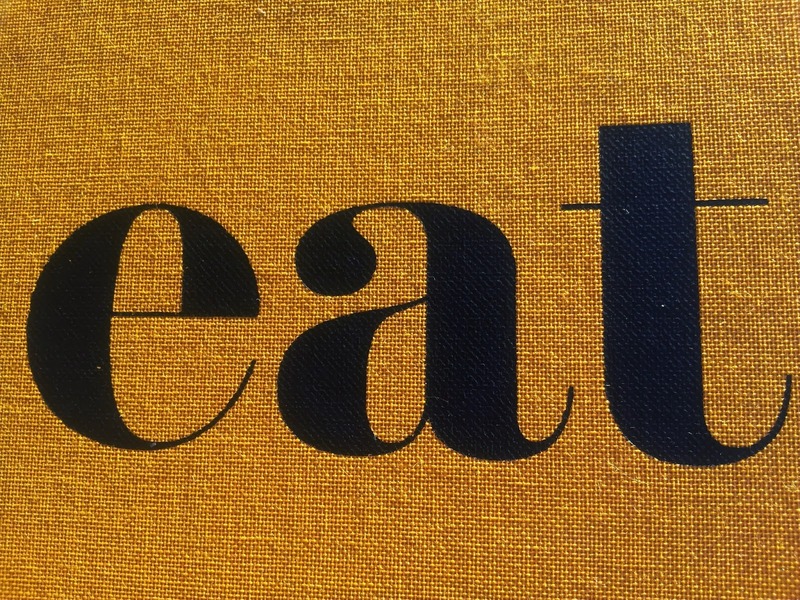 “Eat” was an impulse purchase, sight unseen, simply based on the reviews. From the moment I opened the package I knew I had a different sort of cookbook in my possession. It’s the size of a novel, with a stunningly simple black title printed onto a rich pumpkin fabric cover. Who says you can’t judge a book by it’s cover! Open “Eat” and you are rewarded with clean, modern design and layout that allows you to easily and quickly read the recipes. 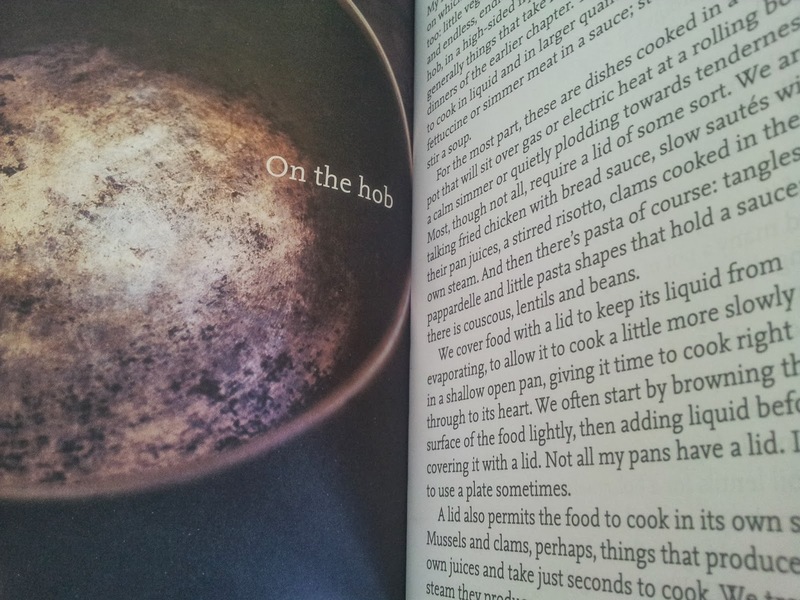 The book is divided into 10 chapters with dishes grouped together based on the method of cooking. And ends with a chapter simply called Puddings. dishes for that style of cooking. The first recipe I tried from “Eat” was rather rich but simply delicious. To give you an idea of how the recipes are presented I copied the recipe just as it is laid out in “Eat”. 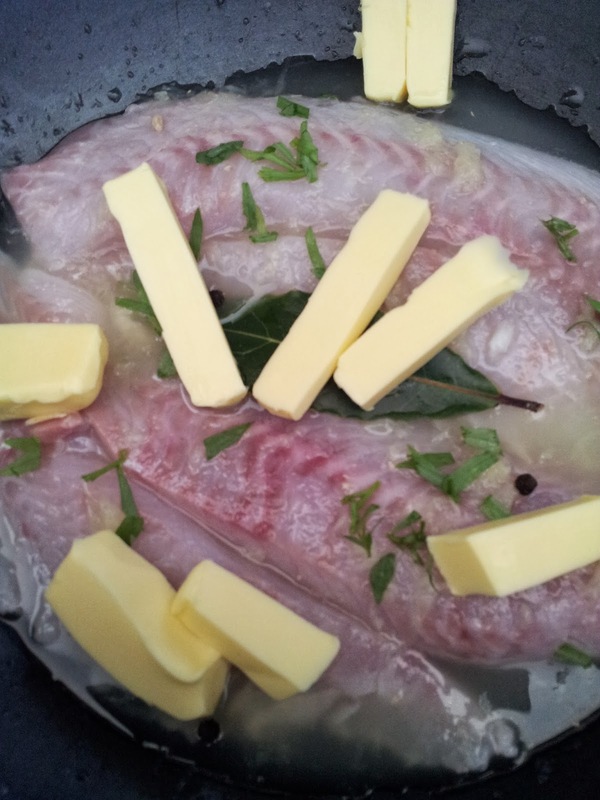 Put 350g cod fillet, cut from the thick end of the fish, into a large shallow pan with the juice of 2 lemons and 40g butter. Chop half a small bunch of tarragon and add to the pan with a bay leaf and 6 black peppercorns. Bring to the boil, lower the heat, cover with a lid and simmer for about 10 minutes, till the fish is opaque. Remove the fish with a fish slice and keep warm. Chop the rest of the bunch of tarragon and add it to the pan with a teaspoon of capers and 3 tablespoons of creme fraiche. The creme fraiche will turn a little grainywhere it meets the lemon juice. No matter. Coarsely flake the fish and spoon the sauce over it. For 2: Soft, white, supremely citrus fish. The lemon juice and the herb Tarragon is the secret to the success of this dish. And true to his word it takes only a few minutes to make. The not so well known herb French Tarragon gave the dish a subtle hint of aniseed. I made this recipe in early December when my tarragon was starting to take off. 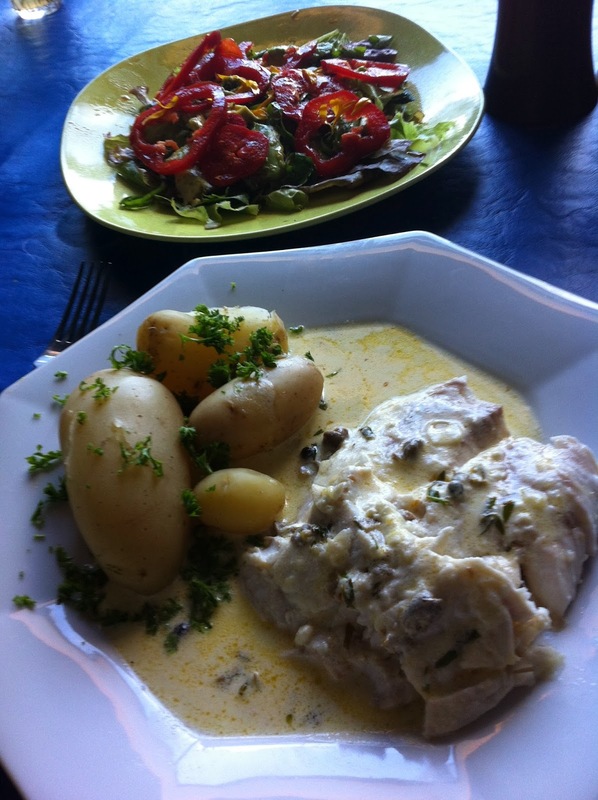 It was a great way to show how a little tarragon adds to the flavours of fish, lemon and cream. continued to grow in a pot. Use the younger new leaves to avoid any bitterness. 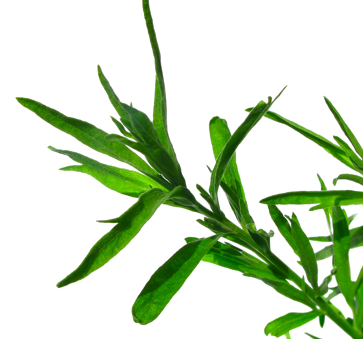 French Tarragon is a delicate herb to grow. It hides underground all winter and in early spring small green shoots appear and is ready to harvest early summer. Tomatoes , eggs, chicken and fish all benefit from the addition of tarragon but it is most commonly used to flavour vinegar and mustards. 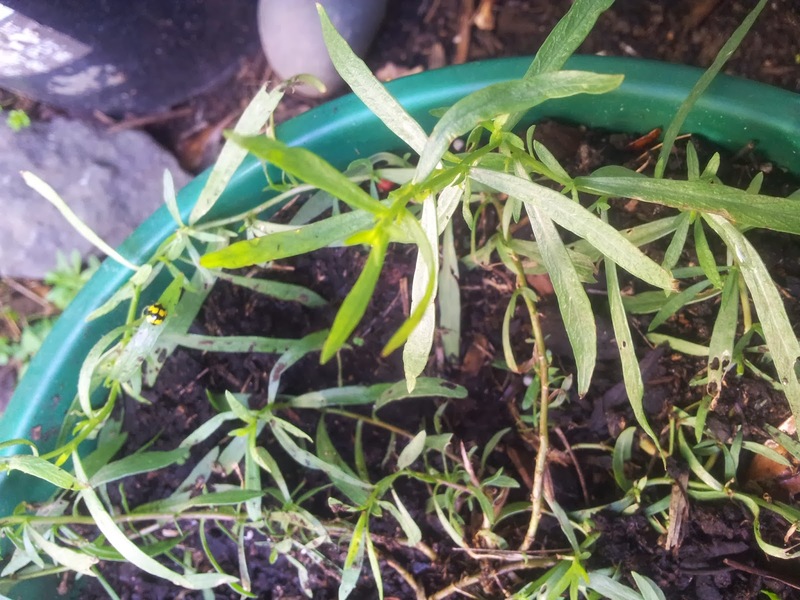 Tarragon hates wet feet and enjoys a sandy soil. It requires good drainage so I have had the most success growing it in a pot where I can control the conditions. The taller growing Russian hasn’t the flavour of French Tarragon. To test whether you have the right nationality of tarragon simply bite a leaf and keep to the front of your tongue. A true French Tarragon will numb the tip of your tongue. 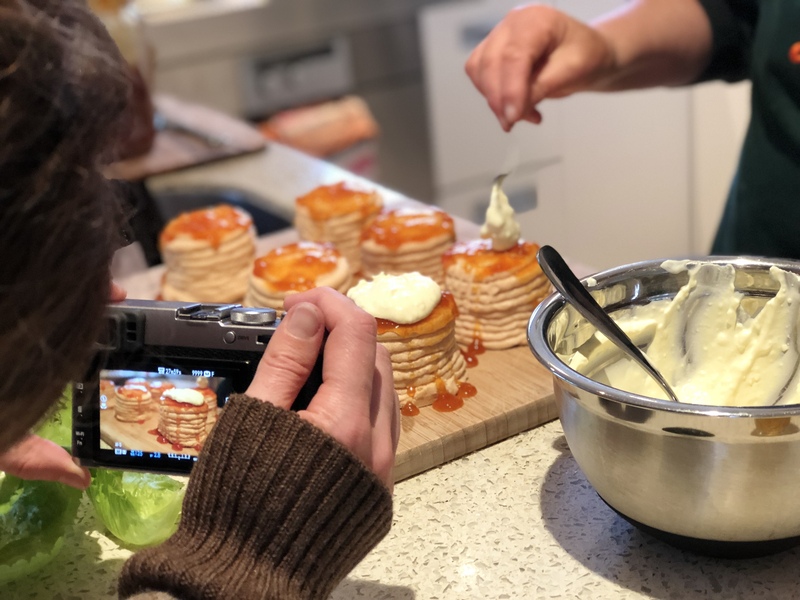 “Opposite many of the recipes are ideas that have bounced off them, a scattering of notes, suggestions and narrative recipes that might also interest you”. After returning home rather late from work I was hungry and wanted something fast. I tried one of his suggested off-shoot ideas, A salsa scramble from the featured recipe Spiced Scrambled Eggs. 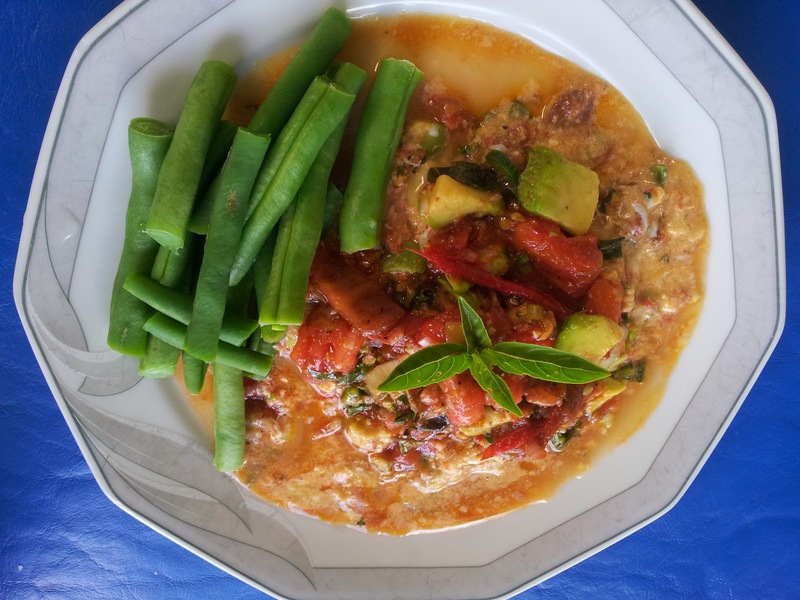 Sizzle a finely chopped tomato, a little finely chopped chilli and some chopped spring onion in a little butter, then stir in half a chopped avocado, a squeeze of lime juice and a little coriander. 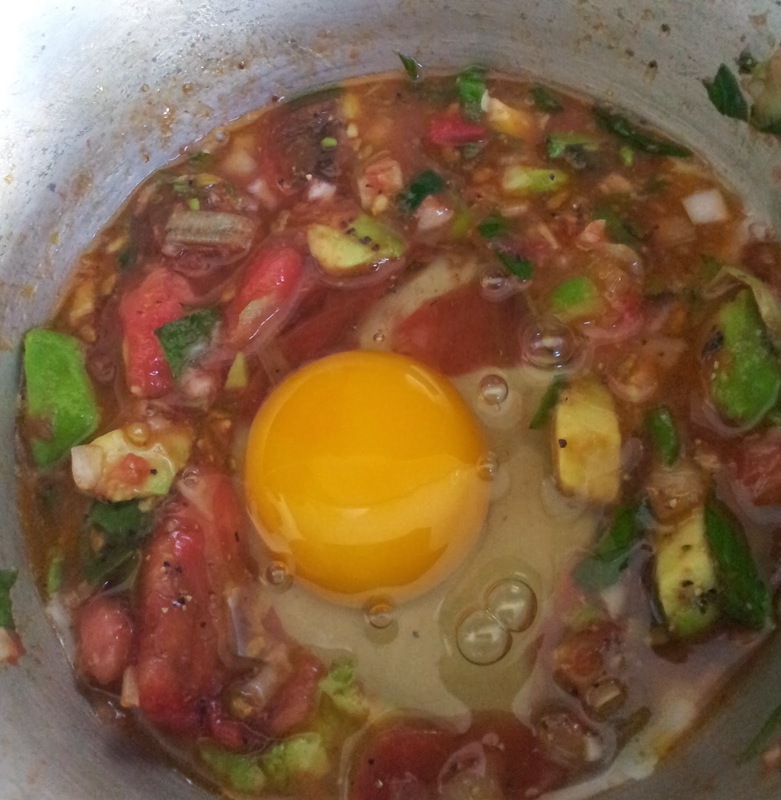 Use half as the base of the scramble, adding the eggs to it once it is hot. Serve the other half as a salsa on the side. This meal took 10 minutes at the most to make. I started by collecting what ingredients I had to match Nigel’s recipe. Darn only one egg left and the scrambled egg recipe used 5 eggs. The recipe was made for two though so I knew one egg would work to create a slightly different version of the salsa scramble. Half an avocado and half a green chilli, although not shown in the photo, I also used. I didn’t have any coriander on hand but have heaps of basil and as tarragon goes well with egg I added a little of that as well. Another change to Nigel’s recipe was to use lime infused olive oil instead of butter as I love olive oil and felt that would better suit the salsa. As it is cooked very quickly you need to do all the cutting up before you start cooking. Only just cook the tomatoes and other vegetables before dividing the salsa into two as you want the salsa portion to be like a salsa, not a sauce. Drop the egg or eggs into the pot and stir immediately. Now I knew that this would taste delicious but mix red tomato with yellow egg and the resulting the peach colour looked like something regurgitated. With more eggs it would look better… but I had a plan. In another pot I quickly cooked a few summer beans as the colour green does wonders. Nigel suggests using the remaining salsa as a side. I decided to top my hot scramble with the lovely red and green salsa. My resulting dish was more of a scrambled soup because I only used one egg but it didn’t matter…it was truly delicious. I could taste the basil and tarragon, then get a hit of chilli and enjoy the texture of the avocado. Tomato and egg is a heavenly combination anyway, and it was created in ten minutes! “Making yourself and others something good to eat can be so little trouble and so much pleasure. And much more satisfying than coming home to a meal in a box”. Thank you Nigel for all the good fast food meals I will make from your little book “EAT”.